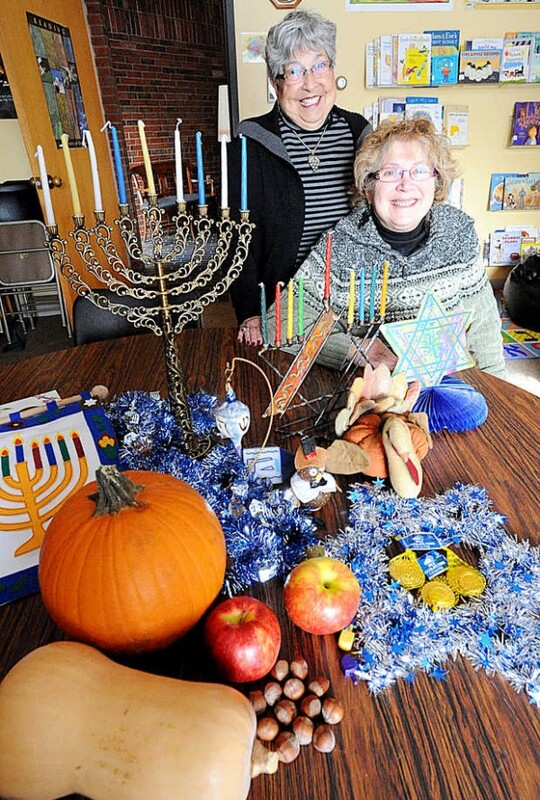 Bertha Bodenheimer, left, and Leslie Weiner pose with some of their family decorations for both Thanksgiving and Hanukkah at Temple Shalom in Auburn Sunday. This year Thanksgiving and Hanukkah align, a phenomenon that may not happen again for more than 70,000 years. It’s just what you’ve always wanted with your Thanksgiving dinner: a little math to go with your turkey, yams and potato pancakes. They’re calling it Thanksgivukkah (some are, anyway), and it’s a rare alignment of Thanksgiving and Hanukkah. How rare? It hasn’t happened in more than 100 years, that much we can agree on. It might not happen again for 79,000 years, although that part of the equation is in dispute. This smooth blend of holidays is happening this year; that’s what’s important. Call it Thanksgivukkah or don’t; that part is completely up to you. Not that Bodenheimer is hindered much by the awkward moniker. The Temple has a lot planned for the holidays, and the rare alignment makes it more interesting. “We’re trying to figure out how to get potato latkes into the turkey,” Bertha said. Food is where it’s at. There are traditional foods for Hanukkah — your latkes, your kugels, your brisket — and there are the regular fixings for Thanksgiving — turkey, yams, stuffing, all those things that make you tired and bloated at the end of the day. For many, bringing all those dishes together will be the challenge. Here’s how a Thanksgivukkah planning session sounds. We’ll let Donna work that out. In the meantime, back to the weird mathematics that make this holiday special and a little confusing. The people at Chadbad.org, a Jewish lifestyle website, worked it all out so that the rest of us can save the lead in our pencils. “Chanukah was declared a Jewish national holiday 2,178 years ago,” wrote Rabbi Tzvi Freeman of Chadbad.org. “Thanksgiving was declared a national American holiday on the last Thursday of every November by Abraham Lincoln in 1863. Before then, Thanksgiving was celebrated on different dates in different states, so we won’t count those. But, using the Chabad.org date converter, you will see that Thanksgiving coincided with the first day of Chanukah on November 29, 1888. It also coincided with the fifth day of Chanukah on November 30, 1899. “On November 28, 1918,” Freeman continues, “Thanksgiving was on Chanukah eve. But since it’s still Thanksgiving until midnight, and Jewish days begin at night, that would still mean that Jewish Americans would have eaten their turkeys that Thanksgiving to the light of their first Chanukah candle. Some have calculated that the next Thanksgivukkah won’t happen for 79,000 years. The problem is that there are variables. Freeman, basing his math on certain assumptions, says it may happen again in 2070, when Thanksgiving falls on Hanukkah Eve. In other words, let’s just eat. For University of Farmington Professor Jonathan Cohen it’s a simple matter of mixing up the holiday schedule to keep everybody happy. Cohen, his wife and their family typically eat Thanksgiving dinner at night. This year? It can’t be done, not with that other holiday insisting on being observed. “This year, we’ll have Thanksgiving dinner midday so we can do Hanukkah at night,” Cohen said. In the Cohen family, there will be no attempts to mix turkey with latkes. That would be too difficult, and it remains unclear how it would taste. Better to have two separate meals to observe the holidays individually. “It’s two different cuisines,” Cohen said. The professor appreciates the congruence of holidays for reasons entirely unrelated to food. The alignment is so rare, people are talking about it, and some of them will be learning more about Jewish holidays. At Temple Shalom, members and guests gather each night of the holiday on the back lawn of the synagogue to light the MegaMenorah, a 12-foot version of the lamp that usually sits in the windows of Jewish homes. The public is welcome to join in the lighting at 5 p.m. on Wednesday for the first night, on Friday at 3:30 p.m. (earlier because of the Jewish Sabbath, which begins at sundown) and at 5 p.m. Saturday through Wednesday, Nov. 30 through Dec. 4. On Saturday, Monday and Tuesday evenings, there will be coffee, hot chocolate and doughnuts to share after the lighting. On Sunday, Dec. 1, following the lighting, Temple Shalom will celebrate its annual Hanukkah party. Most of these things are traditional. There have been some changes, however. Because of the unusual congruence of calendars, there will be no lighting of the MegaMenorah on the second night of the festival, Thursday evening, Nov. 28, which is Thanksgiving. Rabbi Hillel Katzir, the spiritual leader of Temple Shalom, decided to forgo the lighting of the MegaMenorah in the expectation that families will be enjoying Thanksgiving dinner that evening and so are unlikely to come out for the lighting — but the rabbi expects many Jewish families will instead be lighting their hanukkiyah (the special menorah for the holiday) at their Thanksgiving tables. As for Bertha, it remains to be seen if she will experience a successful marriage of turkey and latkes. Unimportant, she said. No matter how novel this thing called Thanksgivukkah might be, it still encompasses the same old concepts.